Every summer, novice and veteran interpreters and interpreting students gather for one week to learn about professional development, and to participate in workshops that build their skills. CSUN Student Nicholas Sanchez, signing the letter ‘S’. Photo taken by Nicholas Sanchez. This year, for the first time, a California State University Northridge student will be hosting one of the workshops at the 10th anniversary for the 2017 Summer Institute for Interpreter’s Professional Development — an event hosted by CSUN’s NCOD: Deaf and Hard of Hearing Services — that provides educational workshops and Continuing Education Unit credits through the Registry of Interpreters for the Deaf to help interpreters maintain their National Interpreter Certification. The weeklong event begins Monday, July 24, and runs through Friday, July 28, from 9 a.m. to 4:30 p.m. in the multipurpose room of the Jean Chisholm Hall, on the east side of campus at 18111 Nordhoff St., in Northridge. “The summer institute provides the continuing education that is a vital part of our field for working interpreters and for future working interpreters,” said Shawn Clark, coordinator of interpreting services at NCOD. Workshops are normally hosted by teachers, professors and experts in interpreting, but this year, Nicholas Sanchez, a senior majoring in interior design and vice president of the student group — the Deaf CSUNians — will host the “Let’s Block & Tackle ASL in Sports” workshop. As a student and athlete who is deaf, Sanchez was familiar with the struggles he experienced with his coaches instructing sports. When Sanchez attended Capuchino High School in San Bruno, Calif., he was recognized as a top athlete for sports such as, football, soccer and track and field. He later spent eight years at five different community colleges searching for a challenging, educational environment in sports. “I felt they didn’t know what they [the coaches] were doing to help me — someone who is deaf — to be well educated,” he said. With the help of Kevin Cikatricis, CSUN interpreter and co-coordinator for the 2017 Summer Institute for Interpreter’s Professional Development, Sanchez submitted his proposal and was honored that his idea was chosen for the event. His passion to help interpreters learn about sports and kinesiology stemmed from his own experiences. 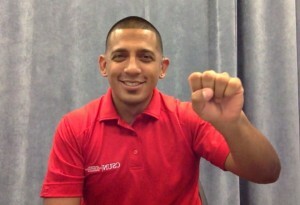 Sanchez will host his workshop in American Sign Language the morning of July 26 and will teach interpreters sports vocabulary, jargon, signs and key concepts for them to gain a well-rounded interpreting knowledge of sports and kinesiology. The goal for NCOD is to make CSUN the summer home for professional skills development said Clark. “A major part of being an interpreter is professional development,” said Clark. “We are always learning and building skills. This is a good place for interpreters to network with each other and to take away some good information for their careers.